Haida tattoos have a distinct style recognized around the world. These tattoos offer artistic designs rich with cultural symbolism. The Haida tribe is native to North America's Canadian west coast and are thought to be one of the oldest traceable peoples of the New World. Historically their artwork was a means to display clan crests, and today this influence can still be seen on carvings, prints and totem poles. When it comes to tattoos, Haida tattoos are nothing new. The Haida culture grew to be a highly tattooed people, and they were one of the first to ink in color using the colors red and black. Traditional Haida tattoos known as ki-da were worn on the forearms, chest, thighs, upper arms, feet and sometimes on finger sections or a person's back. The Haidas are historically known as fearsome warriors. Their artwork, like that of many Native American cultures, often depicted crests decorated to incorporate animals and mythical beings based on the Raven or Eagle, which divided the tribe based on unilineal descent. A crest often showed the owner's lineage. 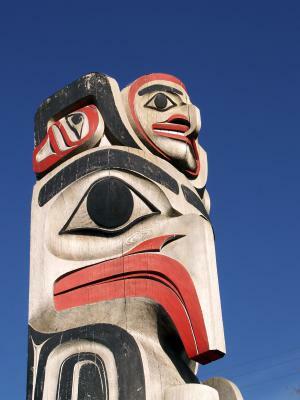 In the Haida belief system, the great spirit Ne-kilst-Lass is the creator of the world and takes on the form of a raven. This design is often used on totem poles but is also widely used in Haida tattoos. In Haida mythology the raven can be a magician and is thought to be responsible for releasing the sun from tiny box. He is also depicted as helping humans. Tattoo ideas based on Haida's great spirit are as endless as your imagination. Reincarnation was a part of the Haida culture. Animals were thought to be a special type of people with the ability to transform into human form. These zoomorphic animals were considered more intelligent than humans. This concept opens the door for creative tattooing that depicts an animal of your choice transforming into a human. Traditionally these animals reflected the Haida social order. Traditional Haida tattoos often depicted matrilineal lineages rather than partriarchol. Create a Haida-style tattoo that shows your line of descent from a female ancestor. This can include grandmother, mother, daughter and granddaughter. This unique type of tattoo is a perfect choice to honor the memory of those who have gone on before you. The Haida culture offers all kinds of possibilities for unique or traditional Haida tattoos. When you're ready to get inked, be sure to choose a tattoo artist experienced in the Haida style to ensure an authentic Haida look.